The study of electron tansfer pathways at membrane proteins or permeation processes in biological membranes can be done in simplified model systems. Using different artificial model membranes like lipid vesicles, lipid membranes, Langmuir-Blodgett layers or planar bilayer membranes has some advantages in comparison to native membranes. Most importantly, the composition of the membrane can easily be controlled by the experimenter. For example hybrid bilayer membranes can be assembled on gold electrodes for electrochemical measurements. 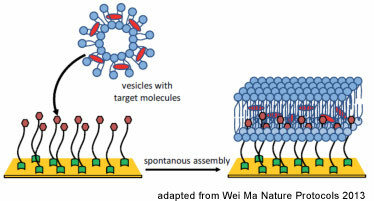 In this process lipid vesicles with target molecules (e.g. redox-active reporters, indicated by the red ellipses within the figure) assemble spontanously on hydrophobic monolayers providing a fluid layer comparable to biological membranes. This approach simplifies the analysis of electron transfer processes of redox-active molecules and their target biomolecules. It also allows the construction of new biohybrid functionalities which imitate natural membrane redox processes. The formation of lipid bilayers on electrodes is also essential for the study of membrane proteins since they provide an environment comparable to the natural situation. Ma, W., Ying, Y.L., Qin, L.X., Gu, Z., Zhou, H., Li, D.W., Sutherland, T.C., Chen, H.Y. and Long, Y.T. (2013) Investigating electron-transfer processes using a biomimetic hybrid bilayer membrane system. Nat Protoc., 8(3):439-50.